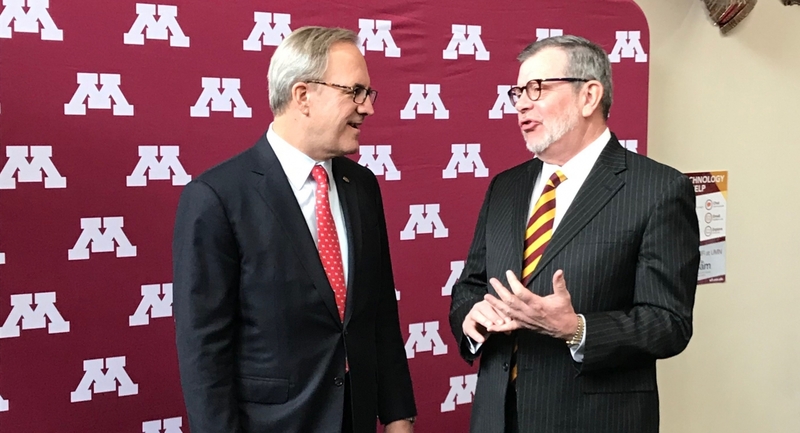 Ecolab Chairman and CEO Doug Baker and University of Minnesota President Eric Kaler discuss the Ecolab Foundation's $5 million gift to the university. MINNEAPOLIS and ST. PAUL, Minn.,December 7, 2018 /3BL Media/ - Ecolab Chairman and CEO Douglas M. Baker, Jr., and University of Minnesota President Eric Kaler today announced a $5 million gift from the Ecolab Foundation to the University-wide Driven campaign, in support of environmental sustainability research and education. A cornerstone of the Ecolab Foundation gift is $2 million to establish an endowed chair for the Institute on the Environment. Founded in 2007, the Institute on the Environment strives to make an impact on our world's most pressing environmental challenges, through supporting innovative research across the disciplines, developing global sustainability leaders, and fostering critical collaboration and partnerships. IonE's current focal areas include a carbon-neutral energy transition, clean, safe drinking water, and sustainable land use. Through work in these areas and across the IonE network, the Institute seeks to lead the way to future in which people and planet prosper together.